FAtiMA Toolkit is a collection of components designed for the creation of characters with social and emotional intelligence. FAtiMA Toolkit is a continuation of the work done in developing the FAtiMA agent architecture. This architecture was initially released in 2005 and, since then, it has been used to control the behaviour of virtual characters and social robots in several applications. Social Importance Dynamics - Adds the ability for the character to judge if an action is socially appropriate or not depending on how it perceives others from a relational standpoint. Role Play Character - Integrates a combination of the previous three assets in a simplified perception-action cycle. 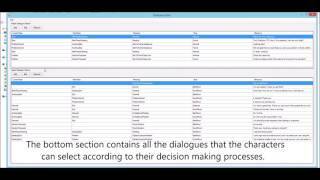 Integrated Authoring Tool - Manages the authoring of a scenario including its characters and respective dialogues. Information on these individual components is available on the RAGE portal. We will provide a link in the Read Me section of the Github page when the website is up. This release includes features such as a chat simulator, a dialogue tree generator, a World Model Asset and a Monte Carlo Tree Search support asset. Additionally we have made several different improvements to existing assets such as Comme il Faut and Role Play Character and IntegratedAuthoringTool assets. We have also created a new website: https://fatima-toolkit.eu/ where users can explore and learn how to use the toolkit.